The man behind the science of Ghostbusting, Dr. Egon Spengler's contributions to the fields of paranormal and geological studies are legendary - as is his impressive collection of spores, molds and fungus. 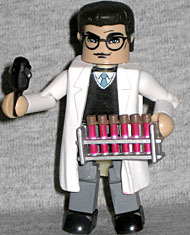 We already had a Ghostbusters II Egon, but that was in his not-as-important-as-you-think-it-was grey uniform, while this shows him as a scientist. He's wearing the same coat seen in the Ready to Believe set, just cast in white instead of blue. Beneath that he's wearing a sweater vest, which seems appropriate for his nerdiness. He comes with a PKE meter and a rack of test tubes filled with mood slime. Some ghosts don't realize they are actually dead and resume the activities of their former lives like the Jogger Ghost. Sighted pushing pedestrians from his path in New York's Central Park, he was only contained after the Ghostbusters laid a ghost trap ambush. Some of the Ghostbusters laid a ghost trap ambush. Ray gave the signal, and Venkman hit the switch. Egon? Nowehere to be seen, so it's not like this set represents a specific scene in the film. 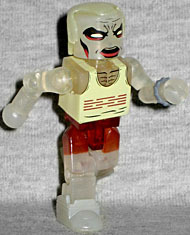 The Jogger Ghost is cast from a translucent yellowish plastic, with solid paint for his shirt, face and the wrinkles on his chest. His shorts are translucent red, despite the fact that the ones on the actual costume were yellow. His hairline is receding, he's wearing a watch (to time his non-existent pulse, naturally) and has big floppy sneakers. The Jogger was played by Jim Fye, who was also under the makeup for Tony Scoleri and the Statue of Liberty, so this figure completes the triumvirate. He's another fun ghost, and while the Egon he comes with isn't the most exciting thing ever, it's a valid design for the character and not one we'd had before.